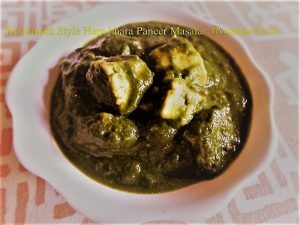 This is a Step-by-Step Recipe for making at home Dhaba or Restaurant Style Hara Bhara Paneer Masala, This is a thick Paneer Masala Gravy, which goes nicely with Roti, Puris or Rice during the main course meals. Wash the Spinach Leaves, boil and grind them. Wash the Coriander Leaves, Mint Leaves and grind them. Soak the Cashew nuts and grind them. Chop the Onion and Tomato. Cut the Paneer into ½ “size pieces. Heat the Oil in a Kadai and add the Cumin Seeds and Onion, Ginger-Garlic, Green Chili Paste, saute for a minute and add the Tomato, saute for a minute. Add the Spinach, Coriander Leaves, Mint Paste, Salt, mix it well and cook for 2-3 minutes on a slow flame. 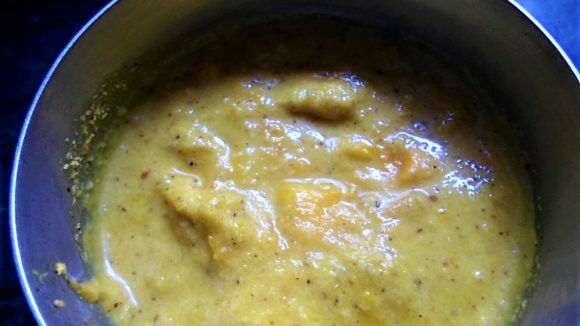 Then add the Butter, Cashew nuts paste, Lemon Juice, a cup of Water, mix it well and cook for 2-3 minutes. After preparing Green Gravy add the Paneer pieces, crushed Black Pepper, mix it well and serve hot with Paratha.